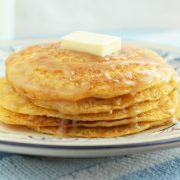 The BEST Buttermilk Pancake recipe! They’re perfectly soft and fluffy, and I’ve yet to meet someone who doesn’t love them. This is one of our favorite breakfasts that we make again and again. Destined to be a favorite in your home too! This is what breakfast is all about!! I’ve been making buttermilk pancakes from scratch for about 15 years (several times each month), so hopefully by now I’ve gotten things figured out. It was one of the first things I learned how to cook when I was a teenager. I was raised in a home where we always used pancake mix. Even on holidays. Yikes. So when I learned how to make homemade buttermilk pancakes from scratch it was pretty much life changing. I guess we just didn’t know what we were missing out on until we tried the real deal. And now I’ll never look back, it’s homemade pancakes for life. Homemade pancakes are just too easy and there’s just no comparison. 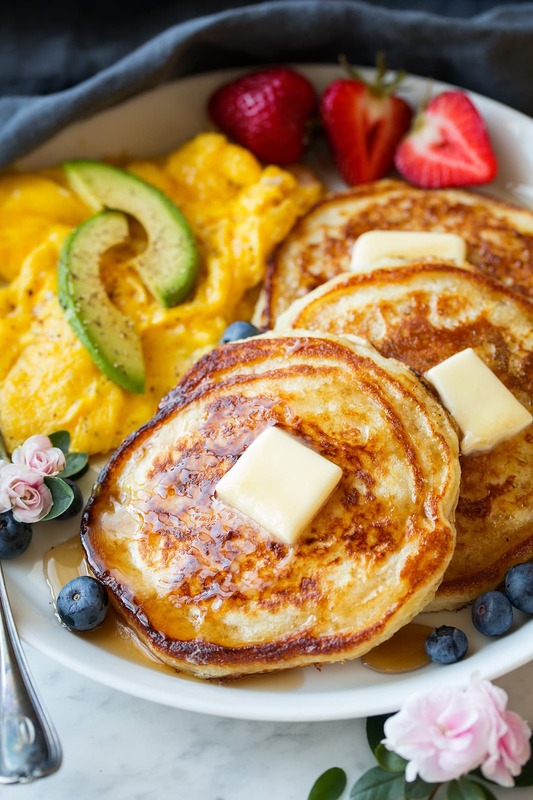 Buttermilk pancakes are one of the all-time best comfort foods! These are the ratios and method I’ve found works best. I hope you fall in love with these too! Whisk dry ingredients and make a well in center. Separately whisk eggs. Mix in buttermilk and and melted butter. Pour buttermilk mixture into flour mixture and whisk just until combined. Grease griddle and ladle on batter in 1/3 cup portions. Cook until golden brown on bottom then flip and cook opposite side until golden brown. What Cooking Equipment Should I Use? 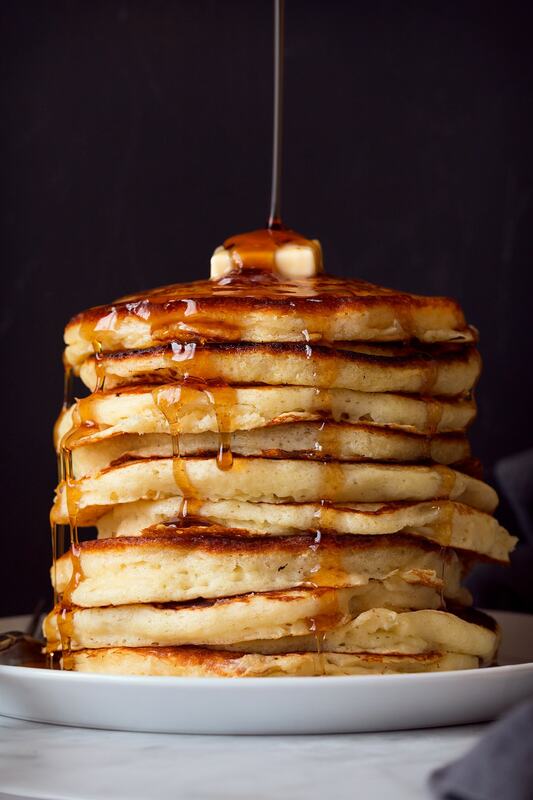 I’ve listed several ways to cook the pancakes, there are benefits to each. Cast iron gives such a nice crisp golden edge (but it can be a little temperamental and more tricky to work with. Pretty easy to get used to though). A skillet seems to cook the homemade buttermilk pancakes the most even, but the only drawback is you can’t fit that many. And an electric griddle can fit a bunch at once and it doesn’t use up stove-top space (I love my BIG electric griddle). You just don’t get those nicely browned edges with this method though. Try out each and see what is your favorite or use what you have. Can I Use a Buttermilk Substitute? I’ve tried using the lemon/vinegar + milk substitute here and it doesn’t work very well. The consistency is a bit different and flavor so I definitely recommend sticking with real buttermilk. Then use what’s left to make buttermilk biscuits or cake. Unless you have multiple griddles chances are you won’t get them all cooked at once. To keep them warm you can keep in a preheated 200 degree oven on a cookie sheet. What Pancake Sides Should I Serve? 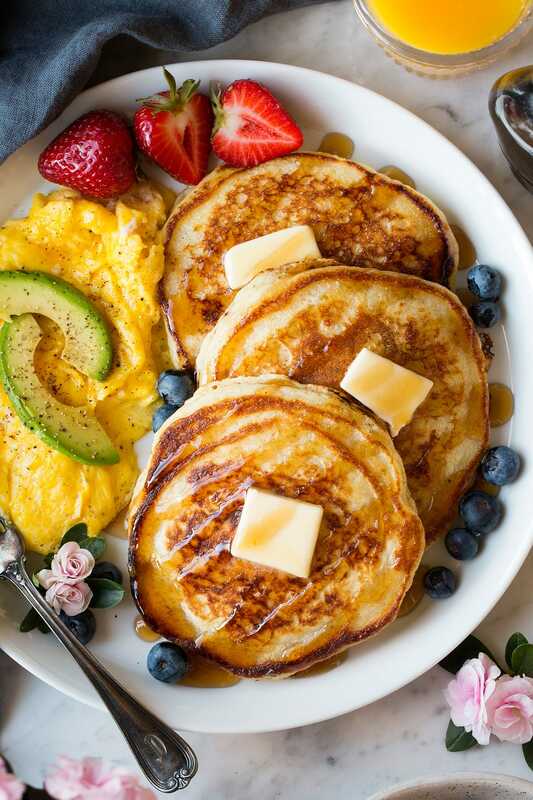 Serve them up with scrambled eggs or omelets, breakfast potatoes or hash browns, oven cooked bacon or breakfast sausage, fresh fruit, and juice or milk. Don’t over-mix the batter! With pancakes, the batter should be a bit lumpy. If over-mixed, the pancakes come out flat. 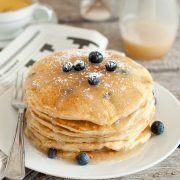 Try blueberries in the pancakes. I like to dot them on after ladling on the griddle (before flipping). Plan on two per person because they are 100% irresistible! If using butter, melt it immediately before ladling pancakes on or it burns. Or use oil, it won’t burn as easily. 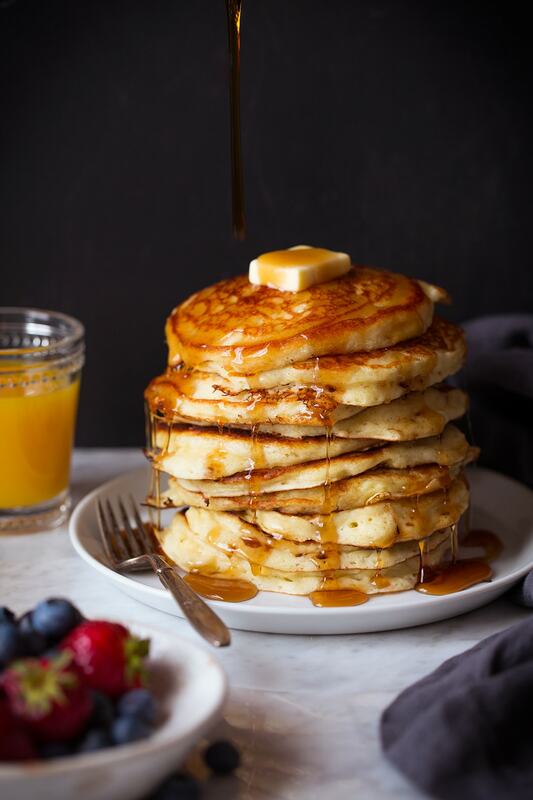 The ultimate buttermilk pancakes! They're soft and fluffy, buttery, moist and tender and just perfectly flavorful. This is homestyle comfort food everyone will love any day of the year, and any time of day! 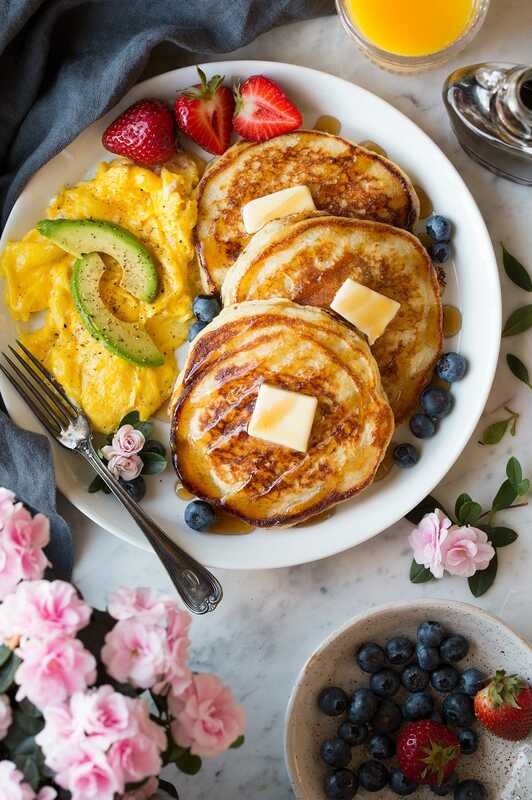 If using a cast iron griddle to cook pancakes preheat it over a gas stove to about medium heat (larger burner medium, smaller burner medium-high, adjust as needed when cooking pancakes). If using an electric griddle to cook pancakes preheat it to 375 degrees. If using non-stick skillets you'll want to have at least two. Skillets will only need to preheat for a minute or two, so wait to warm them until batter is almost ready. In a separate large mixing bowl, whisk together eggs. Pour in buttermilk and and melted butter and whisk to blend (butter may separate and that's fine). Grease griddle with oil or butter right before adding batter (if using cast iron use vegetable oil) and ladle about a slightly heaping 1/3 cup batter at a time into griddle. If you like pancakes a bit thicker use the scoop and level method to measure flour for slightly thinner pancakes use the spoon and level method to measure flour. Use real buttermilk for best results. Don't use the buttermilk substitute (of milk + lemon/vinegar) here. Try them with fresh blueberries too. Dot onto batter after ladling onto griddle before flipping. Try them with different syrups. 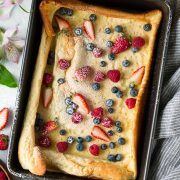 My favorites are homemade blueberry, strawberry or buttermilk (see notes in post above for recipes).